For my son’s first birthday, I made him a Cookie Monster Cake, and on his second birthday, I made him an Elmo Cake. But for the past few years he’s been drawn to desserts in the grocery store bakery over my homemade goodies, so I’ve just gave in and bought him what he wanted. But this year, I guess he’s grown-up enough he realizes cakes and cookies from the bakery taste gross, and he wants Mommy’s (semi) homemade treats again. So yesterday I baked up 4 dozen of these little monster cupcakes for him and all his friends at school. We tried to make these look like the monsters on Monsters University. We did Mike, the green one-eyed monster, the hairy blue monster, Sully and the purple chameleon, Randy. 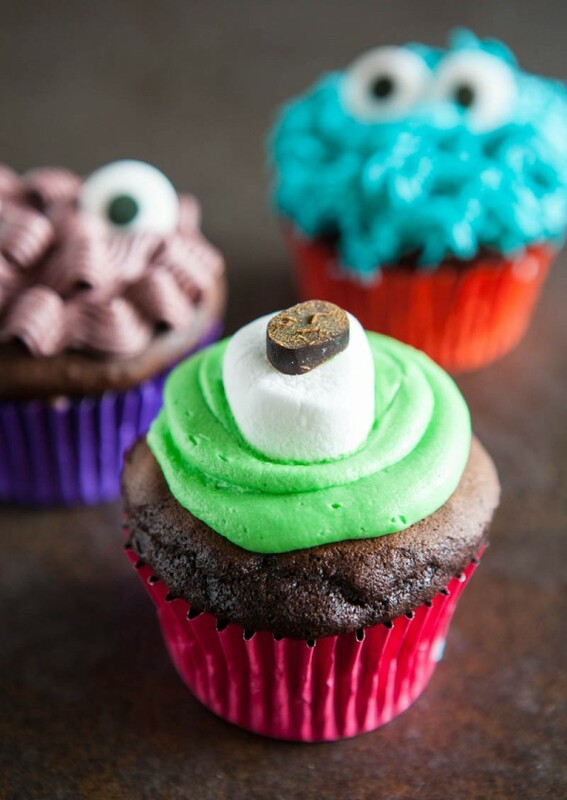 For the green monster, I used a half of a marshmallow and a slice of licorice for the eye. I probably should have used a little chocolate chip because kids these days hate licorice, lesson learned. For the other two monsters, I just used candy eyes that I got from the craft store. They’re made by Wilton and right now they have the cute eyes like these and bloody eyes for Halloween. Bake according to package directions, adding the pudding, extra egg and substituting the water for milk and oil for butter. Beat together softened butter and powdered sugar until grainy. Add vanilla extract and milk. Beat on high until light and fluffy. Divide icing in three separate bowls and color with food coloring. Use a grass frosting tip to make the fur for the blue cupcake. 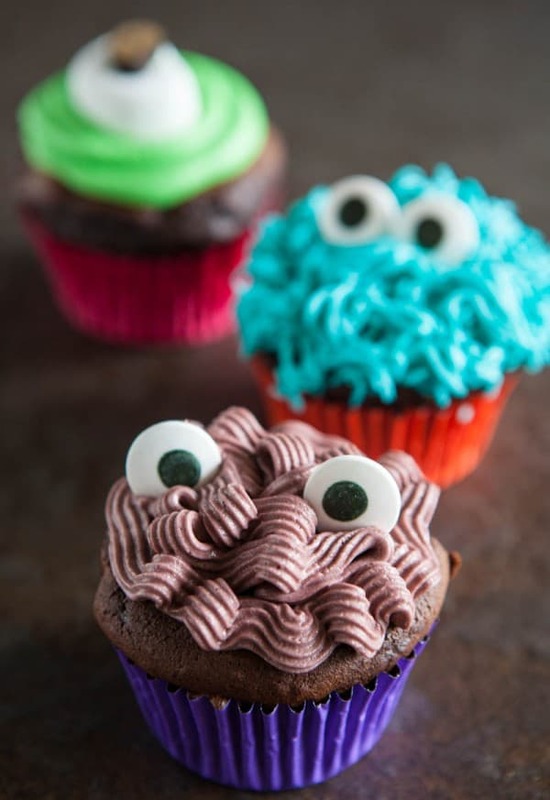 Use a basket frosting tip to make the purple cupcake and a large round tip for the green cupcake. I LOVE this so much!! So cute. Oh man these are cute!! 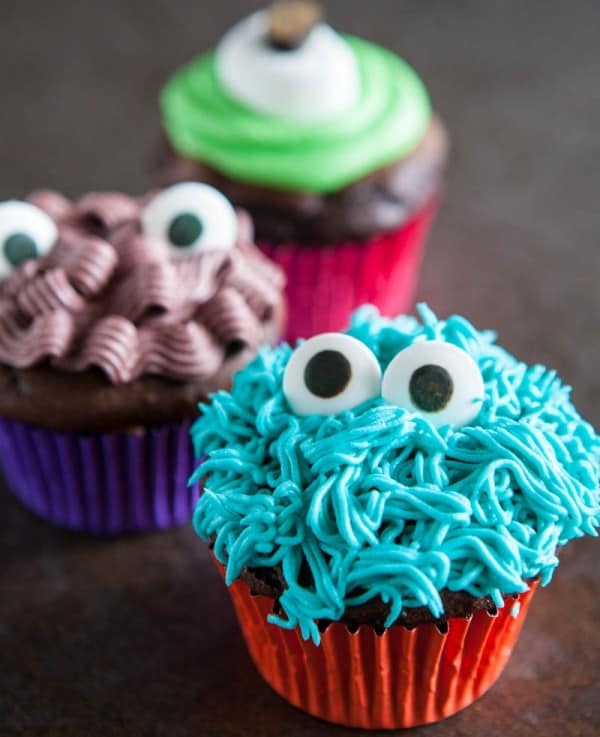 Too cute, these cupcakes. I wish I had the same eye for detail. Adorable! ADORABLE! A! D! O! R! A! B! L! E!